Sure, we love bacon, but what about convenience? How can we get our bacon quicker? According to WTHR in Columbus, Ohio, the students at Ohio State University have lucked out: “The Ohio Pork Council has installed a bacon vending machine in the university’s animal science building at the College Of Food, Agricultural And Environmental Sciences.” 10TV in Columbus adds that the bacon strips or bacon bits in the machine will cost students a mere dollar. The machine will be up until December 13, and stocked by students in the meat science department using donations from companies like Sugardale, Black Label, and Smithfield. Proceeds will benefit the meat science department. 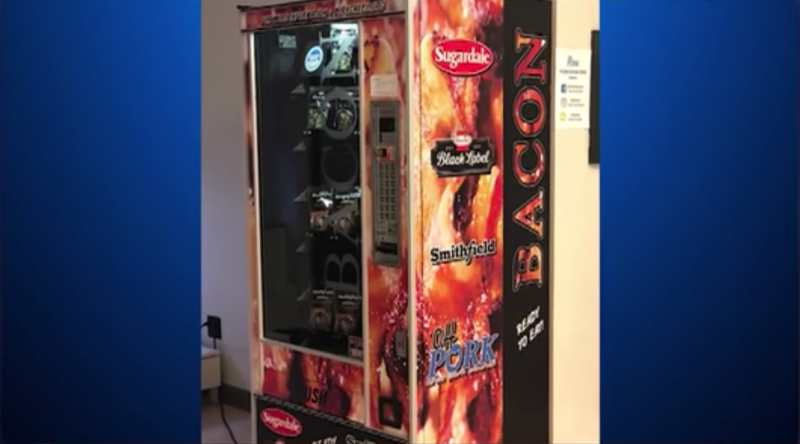 We think this bacon vending machine is a fine idea, but why should young college students get all of that valuable fat and protein? We can think of a beleaguered food website staff that would likely fork over several dollars a week to a similar such machine, just in case this genius idea spreads further. To Chicago, say.